Tube staff that put up ‘Thought for the Day’ messages at Clapham North station say the project has been an overwhelming success. “Our customers really love them,” said station supervisor Gary Dorrithy, who was prompted to follow a similar scheme introduced at the nearby Oval station, also on the Northern line. The high level of appreciation shown by station users has led to Clapham North receiving a London Underground Customer Commendation for its high level of service. It’s not only passengers who are cheered up by the thoughts. “Occasionally a member of staff will say that a specific message has really hit home and helped them during a particularly stressful time,” said Gary Dorrithy. It is our ambition to celebrate the 150th anniversary of the opening of the first section of the world’s first underground railway with a steam-hauled commemorative train. 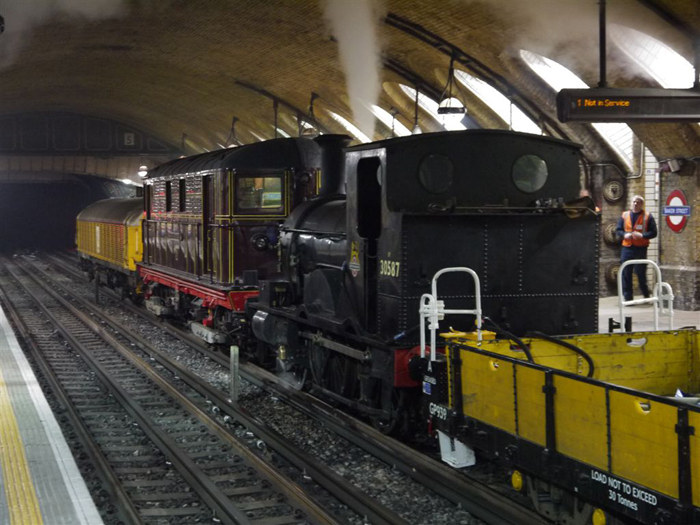 The last time a steam engine hauled a Metropolitan Railway service from Paddington to Farringdon is thought to be 1905, before the conversion to electric traction on the sub-surface railway. 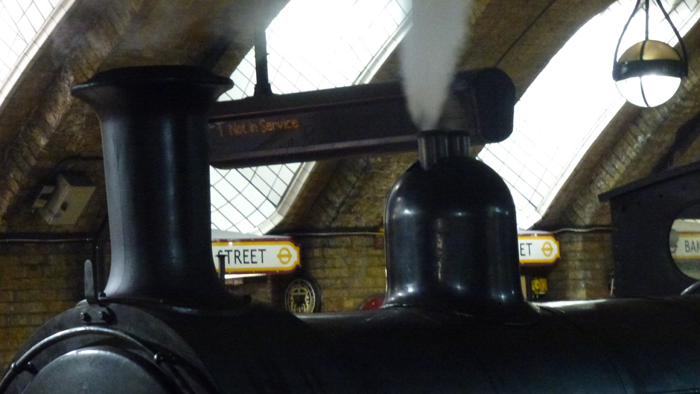 Steam hauled engineers’ trains were a feature of the Underground however up to 1971. A proving run was held early in the morning on 26 January 2012 to test the feasibility of a steam special, with the NRM’s Beattie well tank 30587 (built in 1874) marshalled with ‘Sarah Siddons’ and a coal and water waggon, nurse-maided by two battery locos. 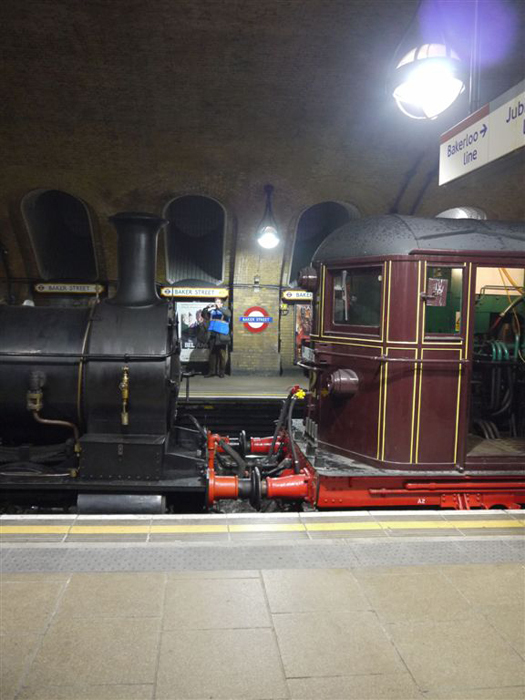 If the restored Met No.1 , the Met coach 353 (both under restoration) and the Asbury set of teak coaches were tore-enact the first run to Farringdon in 1863, what effect might a steam engine have on the modern underground? Formed up at Lillie Bridge, the train picked up a stakeholders and potential major donors at Earl’s Court at 1.30am and then ran round the extension of 1868 to Edgware Road where we joined the original section of the Metropolitan Railway to Baker Street, opened to traffic on 10 January 1863. At Baker Street we paused for 30 minutes to test the effects of the loco blowing off steam which billowed around the brick arched roof, before our train continued eastwards and then pulled back on the westbound road. 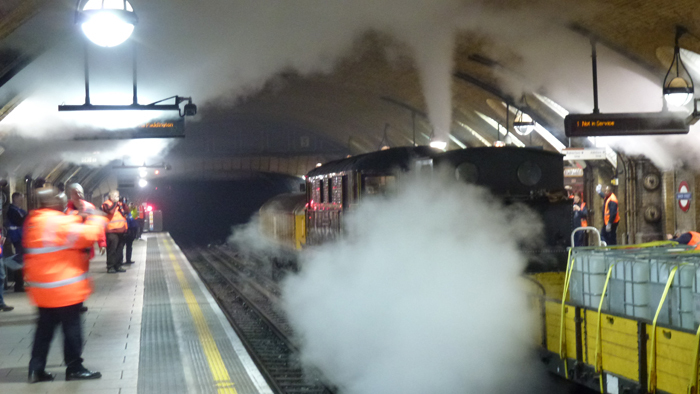 We were joined at Baker Street by the latest ‘S’ stock train to test for any effects from the steam, which provided a neat contrast between the old and the new. Later we pulled back to Edgware Rd and then back to Earls Court and Lillie Bridge. The run went off without a hitch thanks to meticulous preparations and the programme for 2013 itself is now being planned. The run did give a sense of the atmosphere of the steam-hauled era from 1863 to 1905. 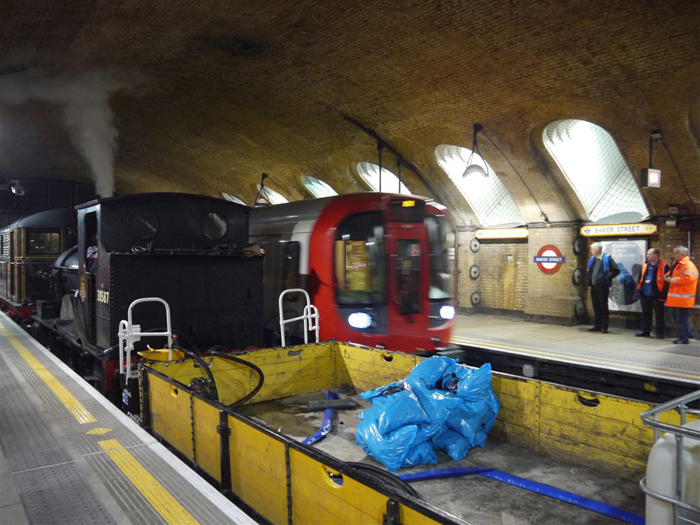 The smell of steam and coal smoke underground and the deafening noise of the safety valves blowing off demonstrated just why coke rather than coal was used to reduce the smoke and condensing apparatus fitted to absorb the spent steam in the Victorian Underground. The cab view of the twists and curves as we ran up from Earl’s Court, as well as seeing the sharp uphill gradient was a revelation to me. The double track tunnel brickwork is craggy and irregular, punctuated by open sections where we could see the dawn creeping up over west London. Many thanks to our Underground colleagues, to the NRM for the loan of the loco and to Bill Parker and his crew from the Flour Mill for contributing to a highly successful and atmospheric event. The success of this test run gives us added incentive to raise the money for the restoration of Met No.1 to head a unique commemorative event in January 2013. Green-fingered staff at Hampstead station have transformed a derelict piece of wasteland into an award-winning garden. Hampstead is the deepest station on the Underground network, with platforms 192 ft deep, 310 steps and the longest spiral staircase on the network. A long-neglected concrete area behind the station’s street-level ticket hall contained waste bins and was covered in rubble. After deciding to improve the space, hours of backbreaking work carried out by station supervisor Neeta Patel and her colleagues have turned it into a colourful garden full of fruit and vegetables. Initial work involved building a series of raised beds and filling them with around 80 bags full of soil, with the pathways between them covered in bark. A wide variety of fruit and vegetables was planted in the first year, among them strawberries, herbs, courgettes, gooseberries and peas, with the bins hidden behind barriers. After entering Underground in Bloom – the Tube’s own annual gardening competition – for the first time in 2010, the garden scooped the Dennis Sanger Chief Operating Officer ‘Special’ award for the team’s efforts. The garden was then enhanced with a variety of flowers, many taken from cuttings in Neeta’s own garden, and colourful hanging baskets. This led to Hampstead winning the fruit and vegetable category for growing a variety of edible treats in a challenging environment in the 2011 competition. “It was a double surprise to win two top prizes in our first two years of entering the competition,” said Neeta. The prize money went towards buying more plants and garden equipment, including a small greenhouse and a garden seat. The garden now has an olive tree and a peanut bush, with seeds for some of the more exotic herbs and vegetables brought back from Neeta’s family home in India. There is even a wormery bin, providing rich environmentally-friendly liquid fertilizer to help plants grow. All of the work is done by station staff in their own time They include station assistant Mary Fisher, station supervisors Stephen Ryan, Bernard Bradley and Naresh Patel, and cleaner Abbey Bola. It’s not every station on the Underground network that has an award-winning garden complete with sculptures, hanging baskets, fruit trees and a pond! Nevertheless this is exactly what staff have created in their spare time at High Barnet station, on the northern tip of the busy Northern line. Marc began the greening of High Barnet in a small way in 2007 with help from the group manager’s assistant Lisa Sainsbury. They started out by planting flowers on a small plot of ground, but soon became more adventurous. “There was a large area of derelict land on some sloping ground by the side of the station which we decided to turn it into the main garden,” said Marc. Other members of the station staff became involved and they all chipped in to help transform the bare site. Using discarded used railway sleepers to help create terracing, the garden features lots of flowers, apple and pear trees, attractive hanging baskets, with large wooden sculptures donated by a local sculptor. “We have planted lots of evergreens to keep the garden looking attractive all year round and put in various seasonal bedding plants,” said Marc. A small lower garden area features a pond. The station receives a small annual gardening budget from London Underground, with the staff contributing in terms of buying plants. “We do all the work needed to maintain the garden in our spare time, either during meal breaks, staying late or on our days off,” said Darren. High Barnet was one of the winners in the 2011 Underground in Bloom the Tube’s own annual gardening competition, coming third in the Hanging Basket category. The station has also won quite a few other Underground in Bloom prizes over the years, plus picking up top awards in the Barnet in Bloom and London in Bloom competitions. In 2011 over 70 stations, depots and service control rooms took part in the Underground in Bloom competition. Staff at a busy London tube station who display humorous ‘Thought for the Day’ quotes have followed it up with a popular web site – and can boast of being featured on Japanese television! It all began in 2011 when Customer Station Assistant (CSA) Ken Walters, who works at Angel Station on the Northern Line, heard about a suburban station where passengers dropping off their partners in the morning were banned from kissing them goodbye. Helping Ken with his daily dose of ticket hall wisdom are fellow CSA’s Devika Webb and Rathees Kadadcham. One of the first jobs for whoever’s on duty to open up the station to passengers each day at 5.40am is to put up that day’s thought. The jokey quotes also appeal to schoolchildren as well as adults and many travellers, including tourists, take photographs of the day’s offering. The Angel trio has put up a comment box in the ticket hall where people can leave their own quote suggestions, which usually go on display within a couple of days. “Lots of people who don’t even use the station come in off the street just to see what’s on the board that day,” said Ken. Rathees is the trio’s computer wizard who knows his way around the internet. He has set up the ‘Thoughts of Angel’ web site (www.thoughtsofangel.com), billed as ‘your daily dose of fun, laughter and thought’. It features images of each day’s message and is seen by around 300 people daily. Every image is archived and visitors to the site can vote for the message they like best. The site is linked to Twitter and Facebook, increasing its exposure, and several hundred people subscribe to its email newsletter. The site has been picked up by blogger Annie Mole and is featured on her ‘Going Underground’ blog, which takes an irreverent look at aspects of the London Underground network. It also features on the Time Out and the islingtonpeople blogs. “Annie, who lives locally, takes a picture of the ‘thought’ every day and downloads it onto her site, which has a link back to our site,” said Rathees. Internet exposure led to the station being featured on Japanese television. For most Underground passengers, the experience of your local station may be little more than entering, touching in your Oyster card, descending to the platform and then boarding your train. You may pay little attention to the station around you and not know very much about the staff who work there. Some Underground staff however have decided to try and buck this trend by making their station environment more interesting and enjoyable for their passengers, colleagues and themselves. Whether it be making more personal announcements, introducing a Thought for the Day scheme, or brightening up the physical environment with a station garden or platform flower bed, there are some amazing things taking place across the network which the Museum wanted to collect. Museum Friend Stephen Barry, a retired journalist, has been on a mission to track down these amazing initiatives over the past few months. Stephen visited stations across the city, speaking to staff, meeting passengers and taking photos of the great projects which are taking place. These stories and images are to be shared on this blog as a series, starting with Angel station’s Thought of the Day. Huge thanks to Stephen for his hard work. We hope you enjoy them!